I don't always do the "Friday Five," but this week's appealed to me and I decided to write one. So here, on Monday, is my "Friday Five." 1. If you could eat dinner with and "get to know" one famous person (living or dead) who would you choose? Oh dear. Such a difficult question. Because no matter who I'd choose, I'd be too shy to really talk to him/her. I also like, for the most part, to keep my illusions about the personna of the public face of the person and not muddy it up by knowing the "real person." (I've had that happen before!) But I guess if I had to pick someone famous to meet, I'd choose Rosie O'Donnell. Don't ask me why. I think it's because I admire the work she's done to help kids and I join with her in the battle to allow gay parents to adopt and we'd at least have a lot in common to talk about. 2. Has the death of a famous person ever had an effect on you? Who was it and how did you feel? The first "famous death" which affected me--and probably everyone in my generation--was the death of John F. Kennedy. I will always remember the feeling in the pit of my stomach when I heard the news, and the surreal weekend we spent glued to the television set, watching the events unfold--listening to the radio in the car and hearing Lee Harvey Oswald being shot--live. Six years later I was married and Paul was a baby. I remember so vividly my mother calling on the phone and saying "Well, are you in mourning?" I asked her why. She said "Judy Garland." I said "what did she do now?" and she told me that Garland had been found dead in her bathroom that morning. I had been a Garland fanatic since 1953, when I first saw A Star Is Born, a movie I've probably now seen more than 100 times. I saw her perform at the Opera House in San Francisco on her first tour through in the late 50s and then on her incredible Carnegie Hall tour, when it came to San Francisco's convention center. I met her on that trip, briefly. Long enough to take her picture and for her to give me an autograph. Her death affected me incredibly. I could still cry about her loss years later. The most recent "famous death" which blindsided me was the death of Jim Henson. We all loved the muppets (who doesn't? ), but I was never really a fanatic or anything like that. So when I began to cry at the news of Henson's death, it surprised me. What surprised me even more was that I continued to cry for days afterwards. I still get teary-eyed when I see a film clip of Kermit singing "It's not easy being green." (Our own stuffed Kermit sits in the living room with a black armband still on his arm.) Amazing how one man can have such an effect on so many people. I also had a very difficult time with the death of Charles Schultz, a man who gave us all so much pleasure for so many years. 3. If you could BE a famous person for 24 hours, who would you choose? Robin Williams. Just once I'd like to know what it's like to be totally uninhibited in public, to be free to say and do outrageous things and not feel self-conscious. 4. Do people ever tell you you look like someone famous? Who? Not now, but when I was in high school, I was walking home from school one day and a guy came running out of a car dealership yelling "Hey!" When I turned around, he looked disappointed and said, "OH. You looked like Judy Garland." It made my day, since I was such a Garland fanatic! 5. Have you ever met anyone famous? My parents tell me that they took me to meet Irene Dunn when she was filming a movie near our house in San Francisco. They tell me that I loved Dunn and was thrilled to meet her. I have absolutely no recollection, either of being particularly enamored of Ms. Dunn, or of meeting her. But I did meet Judy Garland and it was a thrill. It took sitting in the lobby of the Fairmont Hotel in San Francisco for two days, but eventually my patience was rewarded. I was shaking so badly I could hardly hold the Kodak Brownie camera with which I took her picture. She was very gracious and it stood out as one of the most amazing meetings of my adolescence. When you hang around with semi-famous Steve Schalchlin, your paths occasionally cross those of more famous people, since his husband Jim Brochu knows everybody (someday check out Jimmy's biography of his friend Lucille Ball, "Lucy in the Afternoon"). 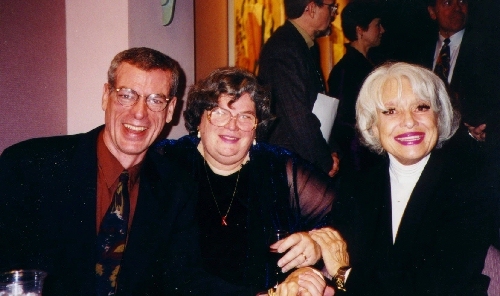 I attended an awards show with Steve and Jimmy and their friend Carol Channing and was amazed to find myself sitting at a table chatting with Ms. Channing while friends and fans came to pay tribute. I've also had the pleasure of getting to know "Internet Journal Legend" SecraTerri :). She's just like regular folks, I was happy to discover. The one thing about "fame," I think is that you become larger than life and nobody can possibly live up to the image that fans have of you. I think it's things like that which prematurely killed stars like Judy Garland and Marilyn Monroe. There's no way to be just a regular person. When I've had the chance to sit down with someone "famous" on the level of "equals," it's been very nice to realize that there is a genuine human being under the glitz and glamour and for the most part, the "real person," with all the warts and all the shortcomings, is actually a much more likeable person than the public figure.